Imagine that suddenly, without warning, all electronics stopped working. Everything with an integrated circuit board simply shutdown, inoperable for no apparent reason. Cellphones wouldn’t work. Neither would televisions and most home appliances. That wouldn’t really matter; the power would be out. Planes would fall from the sky, spotting the landscape with wreckages from commercial jets and private aircraft. The government and local Emergency Response Teams would be powerless to offer any help, paralyzed by their dependence on nonfunctioning high tech equipment. The luxuries on which we’ve come to depend would no longer be available. Our way of life would revert to that of the late 1800’s. These are the likely affects of an ElectroMagnetic Pulse (EMP). The results would be horrific. That’s the subject of William Forstchen’s fictional novel One Second After. In it Forstchen explores how life would dramatically change in a split second for a small American town as a result of a coordinated EMP attack over U.S. soil. If you have a romanticized notion of life without modern day conveniences, this book will be enlightening. The challenges and tough decisions faced by the townsfolk as food becomes scarce, medical supplies expire, and roving gangs of voilent refugees roam the countryside looking for their next prey are eye-opening. Although some of the author’s assumptions about the affects of an EMP are debatable, his assessment of the resulting chaos and subsequent struggled are soberingly realistic. 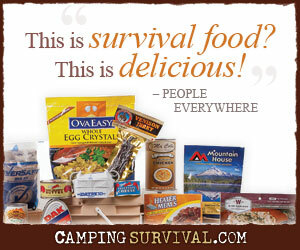 If you are a prepper, you’ll likely enjoy this book. And more importantly, if you are sitting on the fence, unsure of the wisdom or need for prepping, consider it a must read. Good book. Not as depressing as “The Road”, but not a lot of happy endings either. A good book to start new comers thinking…. i bought the book and everytime i picked the book up it made me cry with the reality of it, if you weren’t a planner or a prepper before you will be after reading about the ugly realities that you can/could face. even during WW2 people were starving and all animals were fair game for food. you didn’t see pets anywhere. as a woman after reading this book, how can i in good concious let my children starve when i can save food and supplies to help them live.. Thanks Charleen! Yes, this book is sobering. It’s a must read for new preppers in my mind.